Since my return to the US from my all too short stay in Paris I have been obsessed with the freshness of the ingredients I’m cooking with and eating. One of the many aspects of eating in Paris is the culture of shopping daily at the open markets. Buying the food directly from the farm as fresh as it could possibly be purchased. This not only makes a huge difference in flavor, it also makes a huge difference in nutrition. 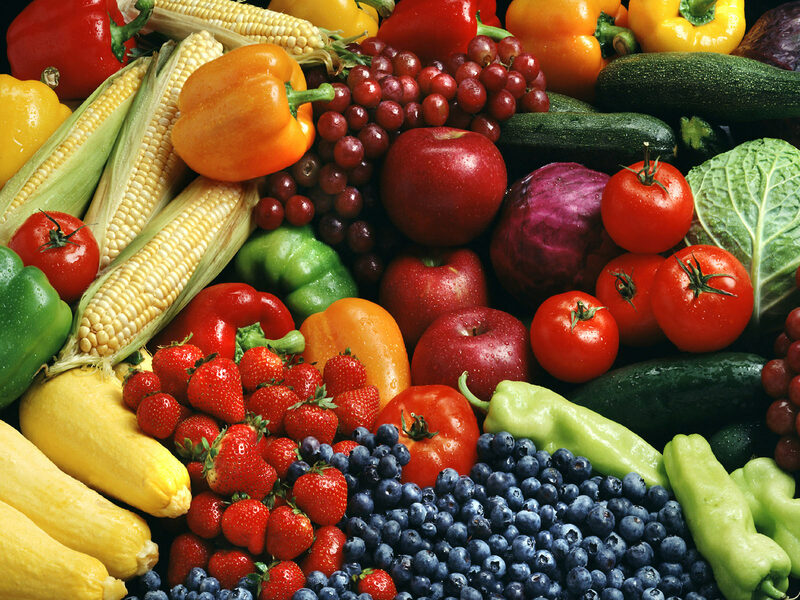 Fruits and vegetables that are purchased in US grocery stores are minimally a week old. This of course depends on how far the food has to travel and how long it is kept in cold storage. In that time we are lucky of 40% of the nutrients from that food is still there. Many of these fruits and vegetables are grown by single source farmers, meaning farmers that only grow one crop – like corn, a practice that can render the soil deficient of nutrients necessary for healthy plants. This means that it becomes necessary to use chemical fertilizers and pesticides. The bottom line is that our mega farms are producing food that is less nutritious and has more chemicals being used in its production. The good news is there are more and more restaurants that are adopting the Farm to Table principle. Chefs working with local farmers to get the products they would like to cook with in their restaurants. This not only includes produce; it includes dairy, grains, and livestock. It is exciting to see farmers and chefs working together and talking to each other about how food is grown or how livestock is fed. The farmers know what the local chefs will buy and therefore are more willing to adopt organic practices to produce more wholesome food. More nutritious and with no chemicals! Imagine how much better it tastes. There is a noticeable difference AND it’s better for you! Another exciting trend, one which I have recently joined, is people buying CSA (Community Supported Agriculture) shares from local farmers. This is an exciting win-win concept where people in the community buy fresh fruits and vegetables for the season from a local farmer in advance. As an individual or family, you are guaranteed fresh and organic fruits and vegetables weekly and the farmer knows how much to plant and grow to support the community it serves. Win-win! 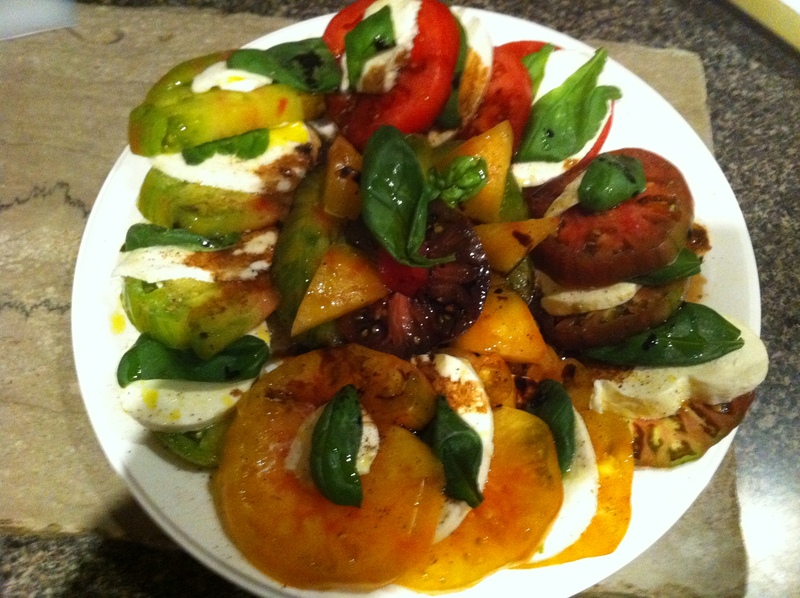 A Caprese Salad I made with fresh heirloom tomatoes, fresh buffalo mozzarella, and basil. As a person who loves to cook this has been an exciting way to challenge myself. Each week I get a large bag full of fresh veggies, herbs, and fruits. I never now exactly what I will be getting so when I get a pound of Swiss Chard for example, something I haven’t cooked with before, I get to explore websites for recipes and try things I have never cooked before. Of course if there is a vegetable or fruit I don’t care for it can make a lovely gift to a friend or neighbor but so far I’ve used everything I have received. The farm where I purchased my share here in Delaware, Highland Orchards, also has their own farm fresh eggs. The difference in the taste and freshness of these eggs is very noticeable to me both in eating them for breakfast or using them in my baking. Another added benefit is that these community-supported farmers are growing many different crops on their land. Through crop rotation, this also ensures that the soil is abundant with nutrients that the plants need to grow in a healthy way. This means that chemicals aren’t necessary because the plants are healthy enough to fight of disease and pests and are in turn more nutritious for us when we eat them. One of the basic principles of good cooking is to use the freshest and best quality ingredients you can find. Buying fresh ingredients from local farmers is one of the best ways to accomplish that. As our grocery stores have made many fruits and vegetable available all year long, we have moved away from the concept of seasonal cooking. Cooking with an ingredient when it is most fresh and ripe also makes a huge difference in flavor and nutrition. In fact there are produce items, such as tomatoes, that are available in grocery stores all year round. There are friends of mine that don’t even know when tomatoes are naturally in season. I don’t mean that tomatoes shouldn’t be available all year round. In many cases, I’m glad they are. But there is a HUGE difference in flavor when the delicious Jersey tomatoes are in season and purchased fresh from the farmer and buying the “tomato-on-the-vine” in the grocery store. I learned a great deal from watching several documentary films, most of which are available to stream on Netflix. Documentaries such as Food Matters, Fat Sick and Nearly Dead, The Gerson Miracle, and Food Inc. have taught me a great deal about the food we are eating and the nutritional value of that food. I recommend checking them out for further information. In the meantime, check out your local farmer’s markets and do a Google search for CSA (Community Supported Agriculture) in your area. It will make a huge difference in your cooking and your health!